The Moment series revolves around the ritual of decanting a finished drink into a cup and the moment of tranquillity after this. The transparency of the container displays the colour and visual qualities of the content. Whilst the profile of the inner shape gives a sense of movement inviting you to pour and savour the sound and smell in this activity. Before, during and after pouring the brew will be on display and the condensation will tell the user that it is hot. At the same time the double wall solution has a thermo effect keeping the liquid warm and the outer shape cool. 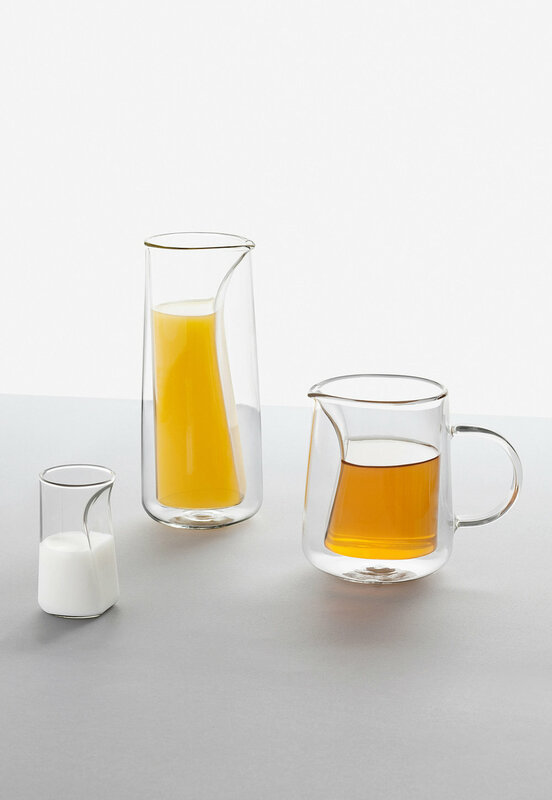 The series consists of a tall container, low container, milk jug, brewer, coffee cup, espresso cup and tumblers. The clean forms of the cups and tumblers let the contents again take centre stage with a subtle flare around the top edge to soften the thin glass as it meets your lips. The project was commissioned as part of the Hotel Wallpaper* in Milan 2016. Rather than creating a intricate kit that can brew the most amazing cup of tea or coffee we wanted to investigate the activity post-brew, building on the idea that the coffee and tea will be brewed to perfection for you. In 2017 Moment won accessory of the year at BoBedre's Norwegian Design Awards.